Especially when someone just gives it to you. For free! This is Cosmic Burst by Mark Cesarik for Free Spirit. The other day I got an email asking if he could send me some swatches of his new line. And of course I said yes. I don't turn down designer fabric. I really don't. Thank you Mark! I ♥ them! Not that I don't have about a million other projects going on right now, but I really couldn't help cutting into these at about 9 o'clock last night. And guess what these little squares were dying to be transformed into? That's right. Granny squares. Don't you just love them right now? I was especially inspired by Jolene's Quilt and her lovely tutorial that can be found HERE. It's super cute. Super, super cute. I'm glad I'm able to pair this gorgeous fabric with my Moda Bella Snow. I have a whole bolt that I ordered back in September. I actually order two bolts - one bright white and one cream (snow). The white bolt? Gone. The Snow? Barely touched it. But I think the cream will be nice with these lovely, vibrant colors, don't you? So just so you don't think I'm a total slacker, I just want to let you know that I have not forgotten about my soon-to-be-released orange and blue quilt pattern. It is pretty much ready to go to the printer. But. I figured while I was going to all that work of marketing 1 pattern...I might as well market 3 patterns. So very, very shortly I will have 3 new patterns to share with you. As soon as I am done posting here, I will be writing up directions for numero tres. I just have to bind it and take a photo. I think it might be my fave. I love free fabric!!! You are just so lucky! 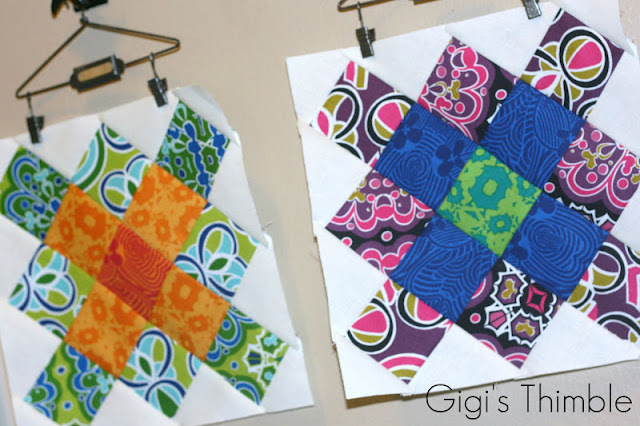 I adore your fabrics, and they are perfect for granny squares..what size did you cut your squares? I guess they can be any size?? This is such a simple design, but really packs a punch..thanks for sharing..
Wow...those blocks are stunning! Great fabrics...lucky you! Beautiful fabric and I love your granny squares! Good luck at your soccer game! How'd you swing that? That's awesome! Your Granny Squares are sooo cute! You would have been crazy to say No and what quilter/fabric acholic would? Those colors and designs are gorgeous.